Cisco IOS permits to define multiple privilege levels for different accounts. 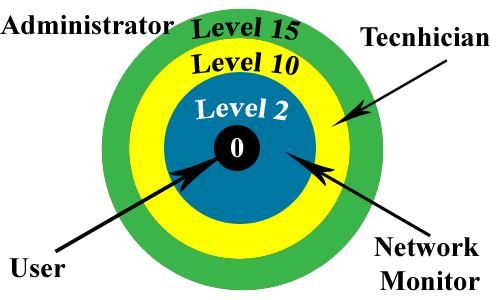 This could be useful when many people work on the same router / switch, but with different roles (operator, tecnhician, network manager) and there is no time to implement an authentication server. There are 16 different privilege levels that can be used. Level 0 is user mode. Level 15 is the privileged mode. Level 1 through 14 are available for customization and use. Displat the running configuration. Even though the level 2 user can execute the show running-config command, only the configure commands that are permitted are actually displayed. In this example the user would see only IP address information from interfaces in the running configuration. Where level in this case is ‘2’. Remember that is not possible to access a customized privilege level that does not have a password.